Immerse yourself in fantasy worlds, art, robots, Star Trek, and more. 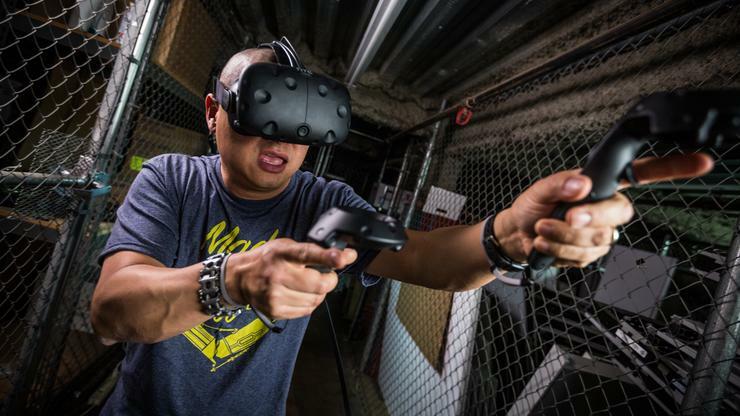 It’s been two years since consumers officially got their hands on virtual reality with the HTC Vive and Oculus Rift, and in that time a lot of VR games have released. Sure, there may still be no singular headset-seller, but trawl Steam or the Oculus Store and you’ll still find hundreds of hours of entertainment—some of it pretty good! So where to start? Well, we compiled a list of our favorite Oculus Rift games and our favorite HTC Vive games back in 2016, and some of those (Job Simulator, Tilt Brush, Chronos) are still worth checking out. The Vive Pro’s recent release is a handy excuse for an update though, and below you’ll find an additional (meaning no repeats from the earlier lists) batch of VR games to jumpstart your collection. Note: Some games are exclusive to one platform or the other, and these have been marked where appropriate. Of course, you'll need a modern VR headset to experience these. The games and experiences on this list are a mix of games for Oculus Rift and HTC Vive. Neither of Bethesda’s ports are amazing made-for-VR experiences. They’re full of control issues, unintuitive interfaces, and other annoyances emblematic of games ported to VR after the fact instead of built for it from the start. But you know what? They’re also enormous. Fallout 4 VR and Skyrim VR are fully-featured ports of the original games, with hundreds of hours of exploration and adventure contained therein. You like post-apocalyptic Boston? Go with Fallout 4 VR. You like frozen fantasy lands, dragons, and shooting flames from your hands? Skyrim VR is your jam. Again, they’re far from perfect—but until VR catches on, these half-baked ports are probably the best we can hope for, at least when it comes to having a “traditional” gaming experience. The Gallery is the closest we’ll come to a repeat entry from our original Vive/Rift recommendations. The game’s first episode, Call of the Starseed, was one of the Vive’s standout launch titles. A combination of Myst-like mechanical puzzles with a larger-than-life science fiction story, it was a perfect early example of what VR could do for adventure games. Follow up Heart of the Emberstone leans into the sci-fi elements, picking up right where the first game ended and whisking players to a wonderfully detailed alien planet. The puzzles aren’t quite as engaging, but I’m mostly fond of The Gallery because whether you're exploring an alien catacomb or standing in a crumbled space-Colosseum, few VR games do a better job making a space feel real. Rule one of VR: For any Oculus Rift exclusive, there is an equal and opposite Vive version. Okay, not all the time, but it happens surprisingly often. Kingspray Graffiti and ViveSpray are the first ones I remember. Kingspray, a promising graffiti-sim, announced a few months after its debut trailer that it’d actually be an Oculus exclusive. The outcry from the Vive community was immediate, and led to someone throwing together ViveSpray—a rough-edged equivalent. With Kingspray coming to Vive a few months after its Rift release, the two now coexist alongside each other. I’m no expert, but I’d say Kingspray has better environments and a more intuitive interface, while ViveSpray 2’s paint physics are slightly better. Both are great tools though. No game has held my interest longer than our own planet, traveling city to city and seeing the most wondrous landmarks from humanity’s history, courtesy of Google Earth VR. Zoom from way out in space down to street level, seamlessly. It’s just an incredible experience. It's even better now that there’s Street View support, actually. When the game first launched I said that would be an obvious addition—Street View is 360-degree panoramas, a natural fit for VR. Obviously Google felt the same, and by simply holding your hand up to your face you can replace Google Earth’s chunky 3D renders with actual photographs. Google Earth VR also supports 360-degree photos uploaded by the community, meaning you can even explore the interiors of some attractions. I spent a night admiring the art of the Louvre by way of random people’s photos, for instance. I first tried out Superhot VR before the Rift was even officially released, back in the DK2 era. All this time later, it’s still one of the most evocative experiences in VR. Like the original 2D game, in Superhot VR time only moves when you move. This lets you pull off all sorts of dramatic stunts, ducking out of the way of bullets, or even stealing the gun from an enemy’s hand before hitting them with a bottle. And it’s one of those games that will hold up long-term, I think. Not only is it unique, the minimalist low-poly art is perfect for VR’s present but will still look great in VR’s future too. Emerging out of Epic’s old Bullet Train demo, Robo Recall seems to stem from a single principle: Make the player feel cool. And it’s successful too. Albeit setup similar to other VR wave shooters, Robo Recall’s appeal is in adopting an over-the-top action movie ethos where the player feels untouchable. Teleport, shoot, teleport, shoot, and when that’s not enough you can always pick up a robot and use it to knock another’s head off. It’s silly cartoonish fun, incredibly slick and satisfying to play. And since it’s from Epic, you know it looks damn great too. Arizona Sunshine felt like a breath of fresh air in late 2016. After nine months of demo-length experiences, finally there was a game with an actual campaign. And that’s still where this zombie-infested desert stands. It’s not a very creative premise nor a life-changing application of VR, but headshotting a horde of approaching zombies is a time-tested delight and Arizona Sunshine gives you plenty of opportunity to do so—plus more scenery and motivation than your average wave-shooter. If you ever fantasized about sitting on the bridge of the Enterprise and boldly going where no one has gone before, Star Trek: Bridge Crew is a dream come true. It gives you and a few friends the chance to embody roles on a starship of your own—one person as captain, another as engineer, a third as helm, and a fourth as tactical officer. Each has a different set of controls, and so while the game consists mostly of turning dials and flipping switches the catch is getting everyone to work together—making sure the engineer powers the engines before helm tries to go to warp, for instance. It’s a bit light on content, but with three committed friends Bridge Crew is still an amazing experience for Star Trek fans. VR Museum of Fine Art is exactly what it sounds like. Using high-res 3D scans of objects from museums around the world, developer Finn Sinclair has constructed a sort-of greatest hits collection where the Mona Lisa lives alongside Michelangelo’s Pieta. The faux-museum also takes advantage of its digital state, constructing exhibits that would never work in real life—like a recreation of the dig site around the Terracotta Army, or a hallway that lets forth onto a life-size reproduction of the Great Buddha of Kamakura, outdoors and sitting placidly in the snow. It’s a cool experience, free, and another stunning example of VR’s educational potential. Early on, one of the most promising VR games was Adr1ft, which had you floating around a derelict space ship in Earth’s orbit. Lone Echo takes those ideas and expands on them, with Oculus Touch support allowing you to reach out, grab the walls of the Kronos II space station, and then launch yourself off them like a human torpedo. It’s one of the coolest movement systems I’ve seen, and with a surprising amount of depth too. That, plus brilliant views of Saturn and a full-length story make Lone Echo one of the Rift’s strongest exclusives. The multiplayer Echo Arena is worth checking out too—a zero-gravity sport, reminiscent of the classic battle scenes from Ender’s Game.